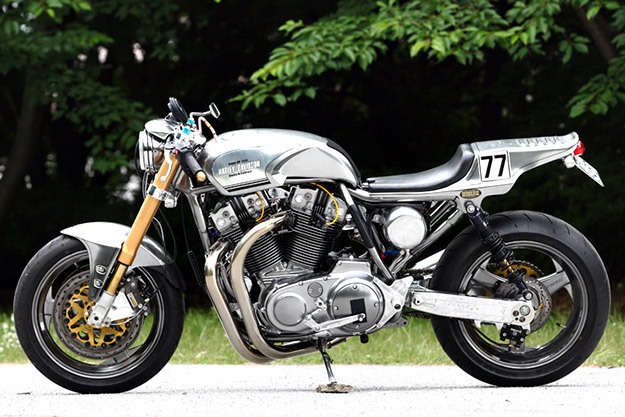 Sundance is one of the top Japanese custom motorcycle builders, but it’s a name unknown to a surprising number of westerners. Zak Shibazaki’s company focuses on performance as much as looks, with a range of high-tech, go-fast goodies designed to eke more horsepower out of stock Harleys. 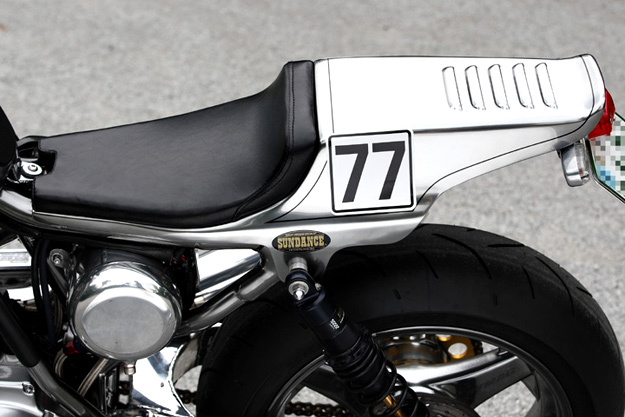 Sundance’s custom bikes always have the ‘go’ to match the ‘show’, and this 2010 machine is a prime example. 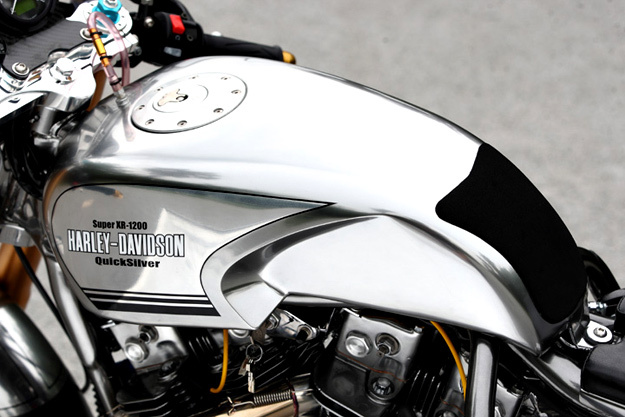 The starting point is a 1995 Harley-Davidson XL1200S frame, with modifications including side rails to beef up the lateral and torsional rigidity. Then there’s a multitude of bespoke parts including that custom aluminum tank and a gorgeous painted carbon fiber seat unit. But the real action, however, comes from the motor. 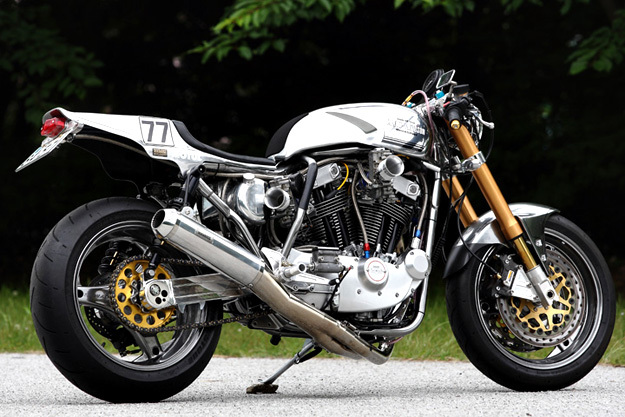 As with all Sundance ‘SuperXR’ engines, the bottom end comes from an Evo Sportster—but everything else is custom-built for racetrack performance. 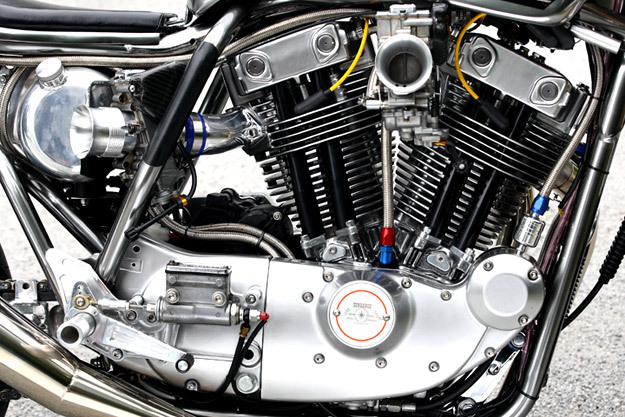 Sleeveless billet aluminum cylinders with NiCaSil-plated bores are crowned by Sundance-designed heads, and each cylinder is fed by a 41mm Sundance-Keihin FCR carb. It’s a relatively small-sized bore that was selected for smoother, more responsive street performance. The motor is tuned for torque and pulls hard from just over 2,000rpm. And there’s around 100hp measured at the rear wheel. (Which explains the heavy-duty Barnett clutch.) 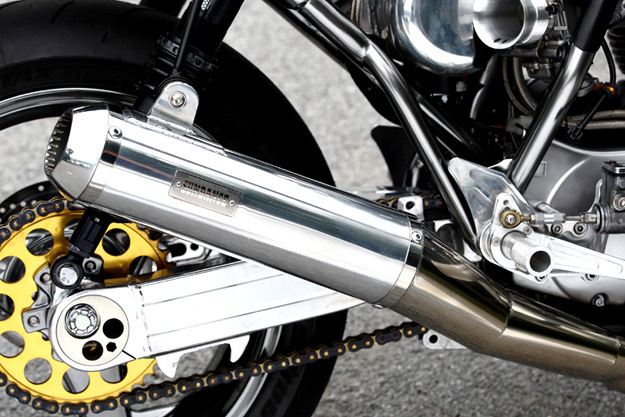 A triple-box-section aluminum swingarm with a revised pivot point keeps the back end planted and at the owner’s request, the forks are gold-finished Öhlins items. The wheels are equally high-spec models from Dymag. 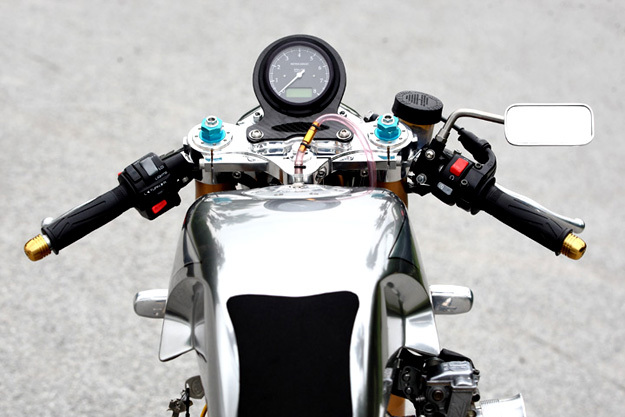 The bike does regular duty at the Tsukuba Circuit, where it reportedly eats CBRs and R1s for lunch. You can get the full spec of QuickSilver in this PDF. And although Harley-Davidson seems to be heading in the right direction now with its styling and marketing, it would do well to take a cue from companies like Sundance—and start working on the performance and handling of its bikes.